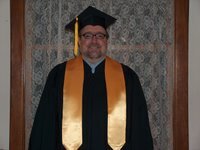 As promised I have pictures from graduation. It was a great day. I arrived at the audi torium around 8am. I met and congratulated some of my classmates. We filed out of the basement by rows and seated ourselves for the commencement at 9am. The commencement began at promptly 9:30am. The speakers were pretty good and the whole ceremony finished in about two hours. They called each graduate by name and if they were graduating with honors. The highlight of the morning was of course walking across the stage with my mock diploma. After the ceremony we went to mom Venus’ apartment clubhouse for a post-graduation party. The party was fun and we had quite a few folks turn out. Click on picture to right to see more.